Processing Time: : 14 business days The processing time is how long the visa would usually take to be obtained from the point at which we have received all the required documents to process your order. It does not include the time needed to post your document(s) to us or for them to be returned to you. 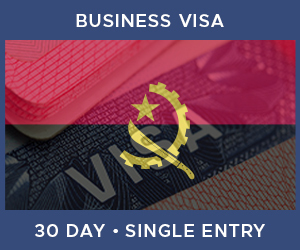 The Embassy of Angola reserves the right to request the presentation of additional documents or demand the presence of the applicant for any application. This is not usual, but we would suggest not booking any non-flexible travel until your visa has been secured. Passport with 6 months validity, 2 blank pages, photocopies of the bio and/or photo page and any previous visa pages. The Embassy requires you write a letter of request for the Visa. This should include the type of visa you are applying for, including the validity and entry type, the reason of your travel and your personal details, such as name, address and profession. Proof of ID or residence permit of the person inviting you. They should provide proof that they are legally residing in the host country.